Sometimes, during the Battle of Saipan, doctors had to operate in blackout conditions. Robert Benney created this painting depicting "Doctors performing brain surgery by flashlight during the blackout of a Japanese air raid." Image online courtesy the U.S. Army Medical Department; Office of Medical History. Days passed and, with Army support, the Marines were able to take over key enemy fortifications. Using a mountain gun they captured from the Japanese, Marines turned the gun on Garapan, the administrative center of the island. Headquarters did not believe them. And why should they? The Japanese had imitated American broadcasts many times before. The Marine says he will never forget the message that was sent by the single Navajo in the battalion, although he couldn’t understand a word of it. A few minutes later he and his comrades saw a cloud of smoke rising from the Japanese positions. The Marines set up refugee camps, away from the fighting, for people whose homes were in the battle areas. The Corps itself suffered heavy casualties. Some soldiers were buried at sea. Others, including an unknown Marine, were buried on the island. 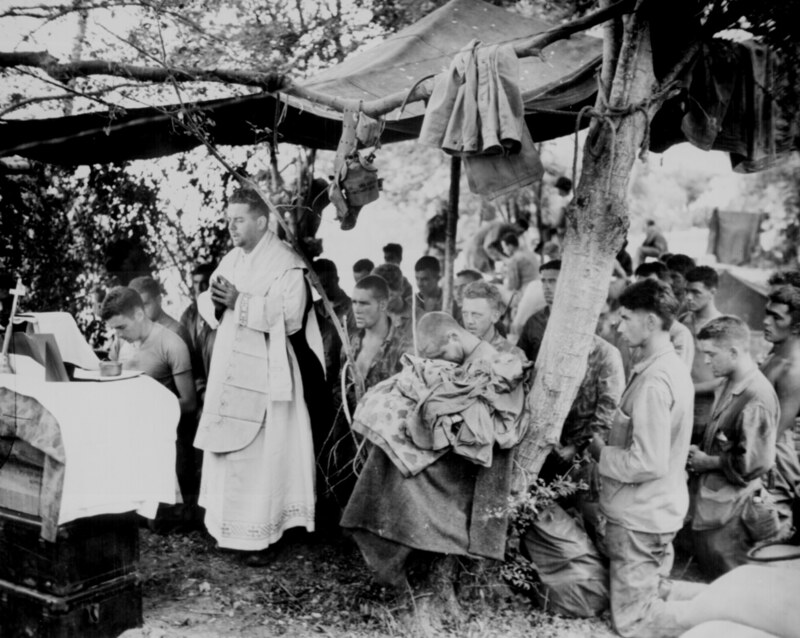 A Navy chaplain held a Mass for some of the 2,000 Marines who fell during the initial landings. Nothing, however, could have prepared the Americans for the biggest banzai charge of the war which took place during the early morning of July 7. Realizing they were going to lose Saipan, huge numbers of Japanese committed mass suicide. Bos, Carole "CODE TALKERS and the BATTLE of SAIPAN" AwesomeStories.com. Jun 01, 2002. Apr 25, 2019.